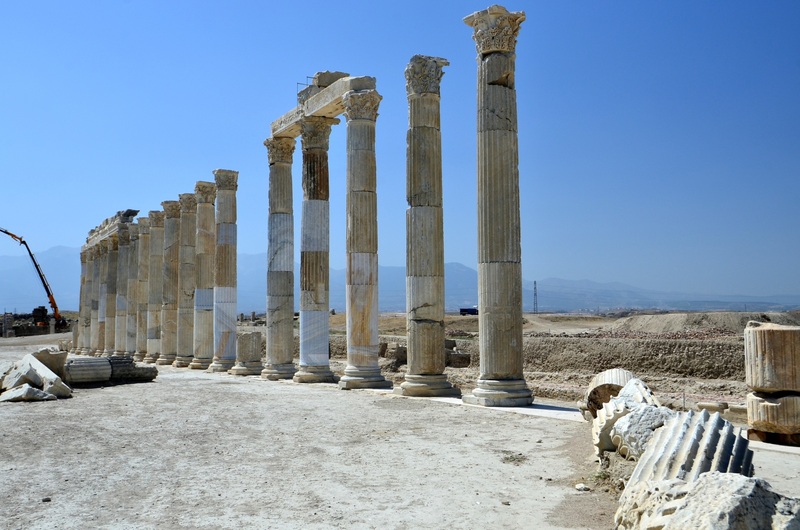 Laodicea is situated on a hill between fertile valleys irrigated by the waters of Asopus (tr. Gümüşçay) and Kapros (tr. Başlıçay) streams. They are the tributaries of the Lycus River, now known as Çürüksu Çayı, which flows on the north-eastern side of the hill. This river gave Laodicea its cognomen - ad Lycum - meaning in the River Lycus. It distinguishes this city from other Laodiceas founded by Antiochus II. 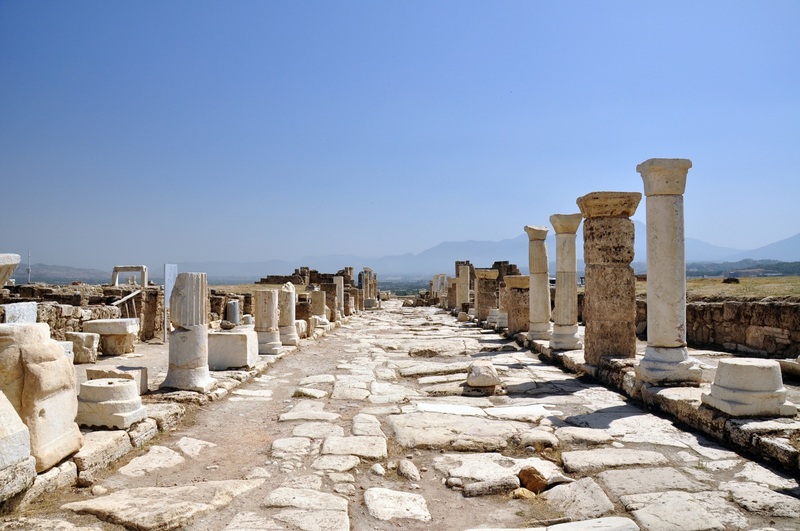 Laodicea was founded on an important trade route, leading to this city from Sardis through Philadelphia. In its neighbourhood, there are many important ancient cities. 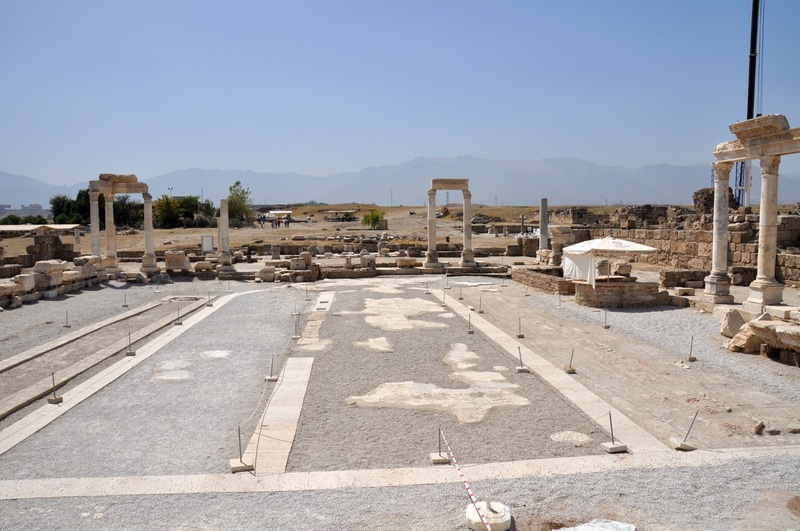 Just 10 km to the north of Laodicea, there is the famous Roman spa of Hierapolis. Colossae, known from the Epistle to the Colossians written by St. Paul, are 14.5 km to the east. 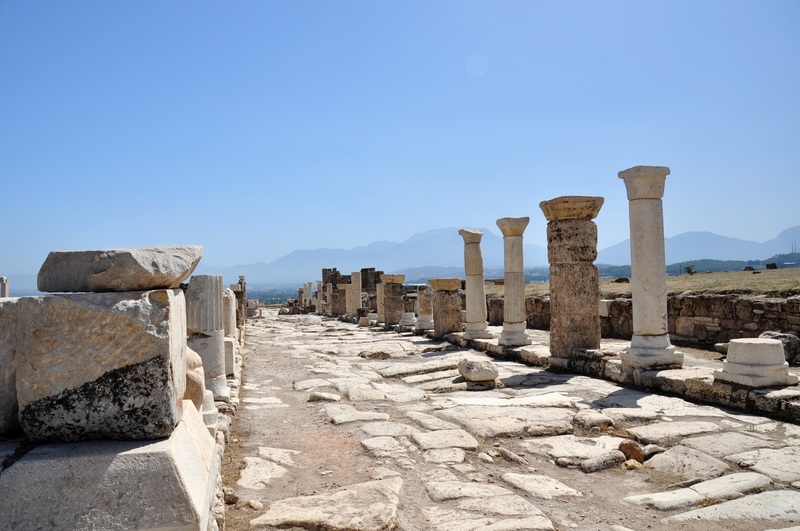 The city of Tripolis on the Meander is located on the road to Sardis, 26 km to the north-west of Laodicea. 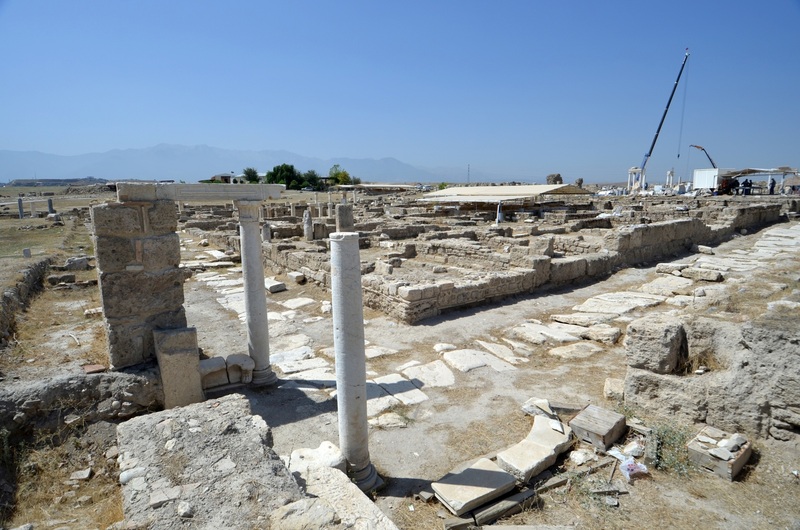 The excavations conducted in Laodicea and its immediate neighbourhood have shown that the oldest traces of human activity in the area can be dated to the period of the Late Chalcolithic and the Early Bronze Age periods, i.e. from 3500 to 3000 BCE. Researchers have found tools made of flint and obsidian from this time. 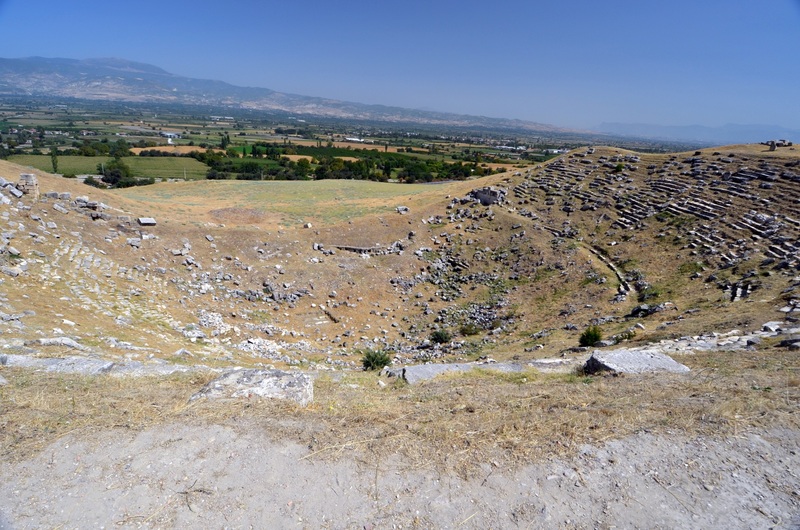 Moreover, the excavations in the area of the northern necropolis of Laodicea have demonstrated that the settlement had already existed in this location before the foundation of the city in the Hellenistic period. 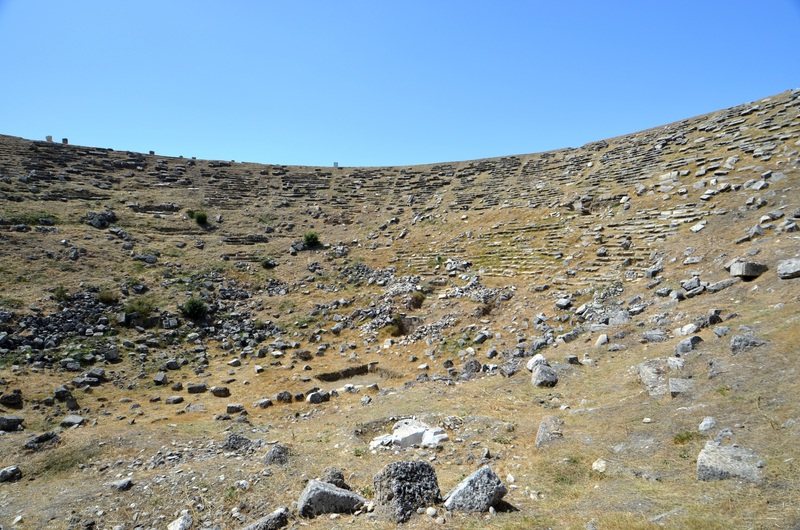 Coins and pottery fragments from the 4th century BCE indicate that the area was then inhabited by the native population from the territory of Asia Minor. The settlement was initially called Dispolis i.e. the City of Zeus, and then - Rhodas. 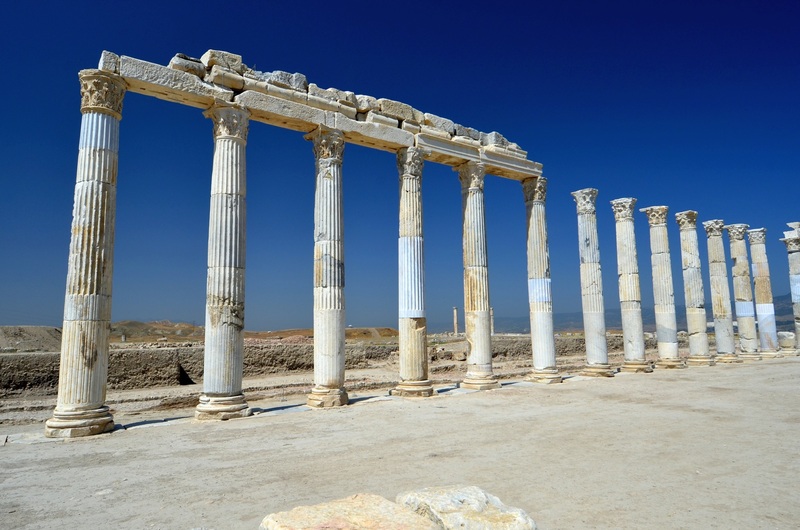 Laodicea was founded in the mid-third century BCE as a Hellenistic city by the ruler from the Seleucid dynasty, Antiochus II Theos. 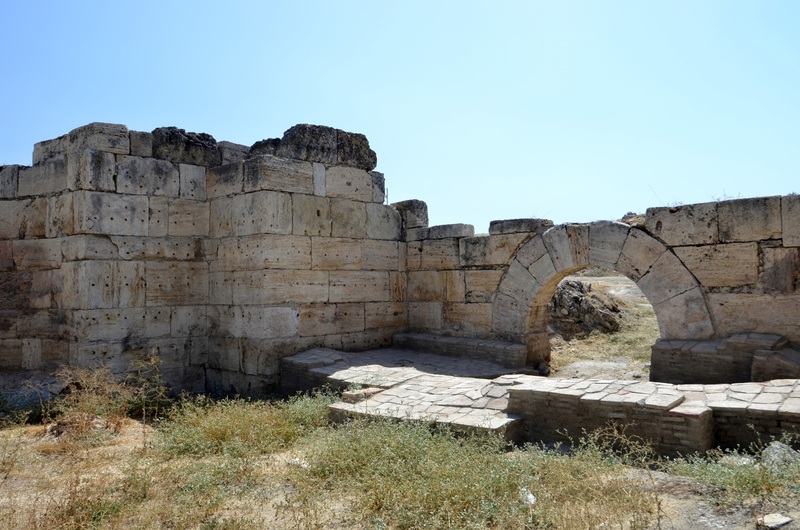 At this point, it is worth mentioning that in the area of modern Turkey, there are two other Laodiceas: Laodicea Pontica, now Ladik, in the Samsun Province, and Laodicea Combusta, also now called Ladik, in the Konya Province. The name Laodicea was given to many cities by Antiochus, to honour his wife, Laodice, who was also his cousin. This marriage was a very turbulent one. In 250 BCE, Antiochus made an alliance with Ptolemy II Philadelphus, the king of Egypt. To seal the treaty, Antiochus married Ptolemy's daughter Berenice. He repudiated Laodice and exiled her, together with their children, to Ephesus. When Ptolemy II died, just four years later, Antiochus remarried Laodice and died in the same year. His quick death gave ground to the rumours that he was poisoned by Laodice. Certainly, she was not a gentle person, because, after the death of her husband, she had Berenice and her son murdered. 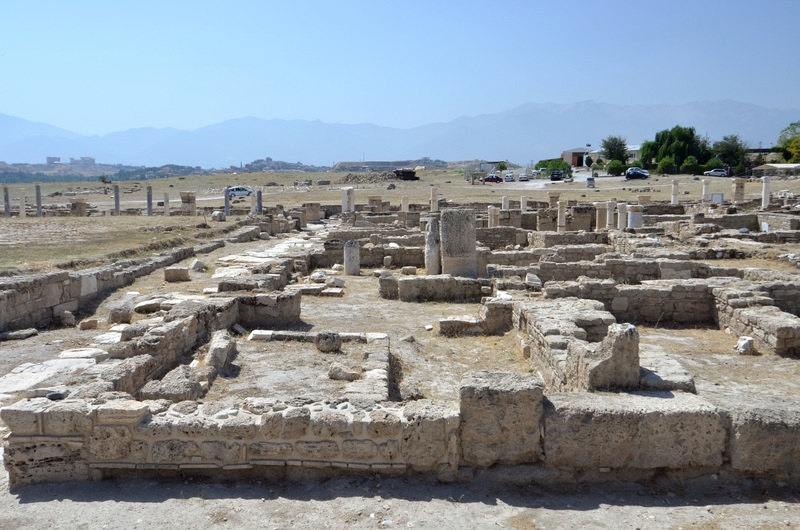 Initially, Laodicea was not a major city, but soon it began to develop very quickly. In the 20s of the 3rd century BCE, it witnessed a conflict for the control of the Seleucid Empire between Antiochus III the Great and his kinsman, Achaeus. Earlier, Achaeus conducted a successful military campaign in Asia Minor on behalf of Antiochus, against the Attalids of Pergamon. Surprisingly, in 221 BCE, he proclaimed himself a king, probably because of the rumours about the death of Antiochus in his Syrian campaign. Eventually, Antiochus III defeated Achaeus in 213 BCE. Antiochus III the Great brought to the area of Phrygia two thousand Jewish families from Babylon. 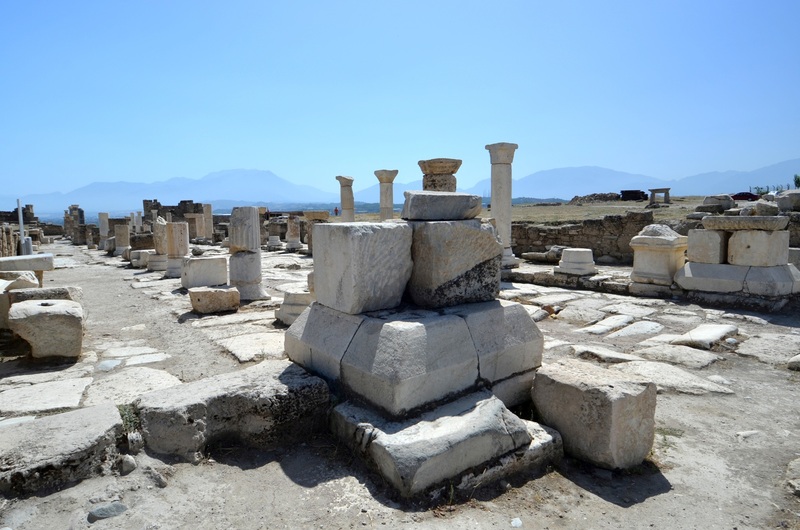 From this moment, Laodicea had a significant Jewish community. The wealth of this community was legendary as it sent 9 kilogrammes of gold to the Temple in Jerusalem every year. Lucius Valerius Flaccus, the governor of the province of Asia, once confiscated the entire package. This event is mentioned in the speech Cicero made in defence of Lucius Valerius (Pro Flacco). Later, the Jewish community of Laodicea became the basis for the creation of an early Christian community. In 188 BCE, the Battle of Magnesia was fought between the Roman troops and the forces of the Seleucid ruler, Antiochus III. As a result of its outcome, favourable for the Romans, the Treaty of Apamea was signed two years later. Its provisions gave the control of the whole region of western Asia Minor to the Kingdom of Pergamon. With the death of the last king of this state, its territory was bequested to Rome. At the beginning of the first century BCE, Asia Minor was shaken by the series of wars, waged in its territory between Rome and the Pontic king Mithridates VI. 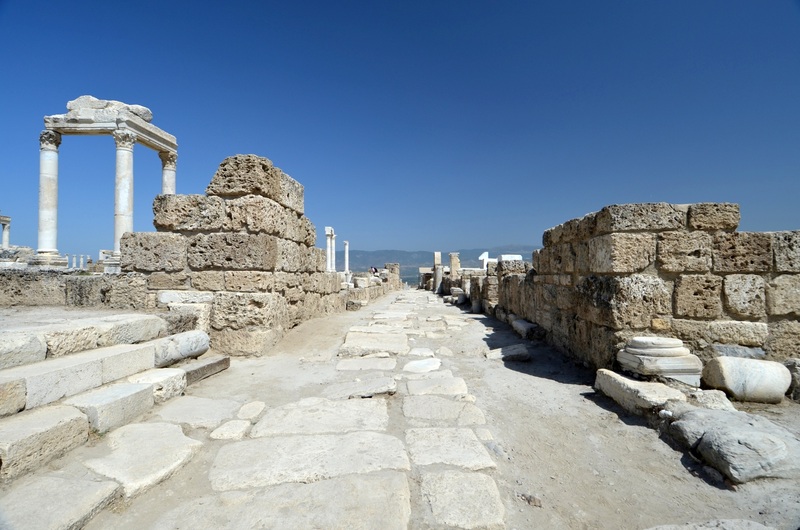 Many cities, including Laodicea, suffered heavily as the result of these events. 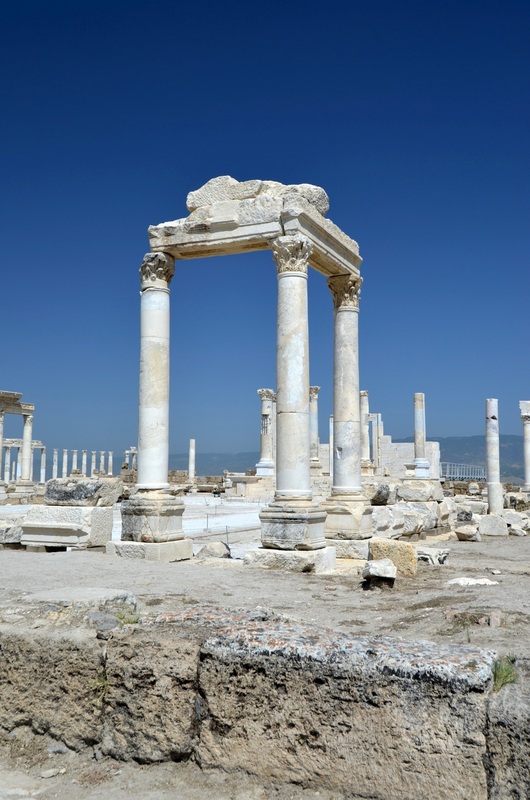 Laodicea quickly recovered from the devastation and Rome granted it the status of a free city. The golden era of Laodicea's prosperity was between the 1st and the 5th centuries CE. Trade was the primary source of income for Laodicea, because of the city's location on a crucial merchant route. The most important export commodities were textiles and famous black wool of Laodicea, mentioned by Strabo. The city produced a textile referred to as Laodicean, listed in the edict of Emperor Diocletian. Tunics manufactured in Laodicea, called trimata, were so well-known that the city was sometimes referred to Trimataria. It is worth noting that even today the most significant source of income of the Denizli Province is the clothing industry. Laodiceans also traded marble, cattle, and grain. 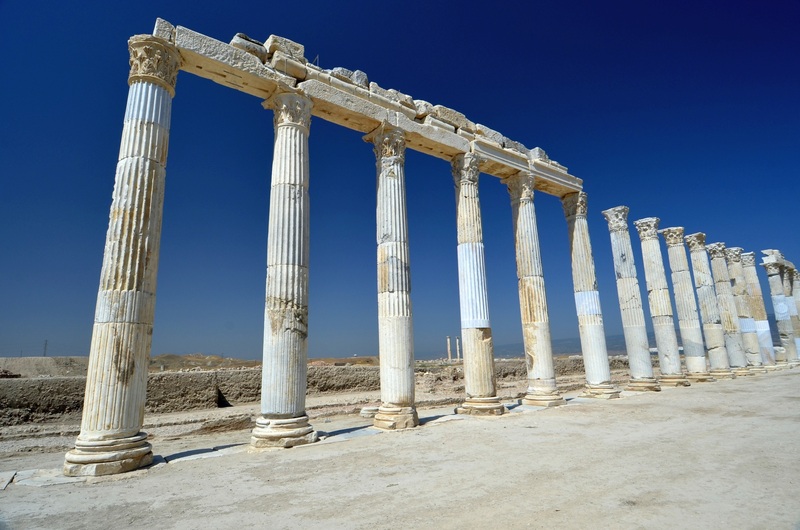 Since the 1st century CE, Laodicea functioned a leading centre of medicine and a medical school. Its most famous graduate was Demosthenes Philalethes, the author of the most influential work in the field of ophthalmology of the ancient period. His work, Ophthalmicus, which discussed the diseases of the eyes, was even used in the Middle Ages. Moreover, the production of the famous "Phrygian powder" is related to Laodicea. It was a medicine used for treating eye diseases. Local resources of zinc and alum became the basis for the production of eye ointments, known as kollyria, also sold by merchants from Laodicea. 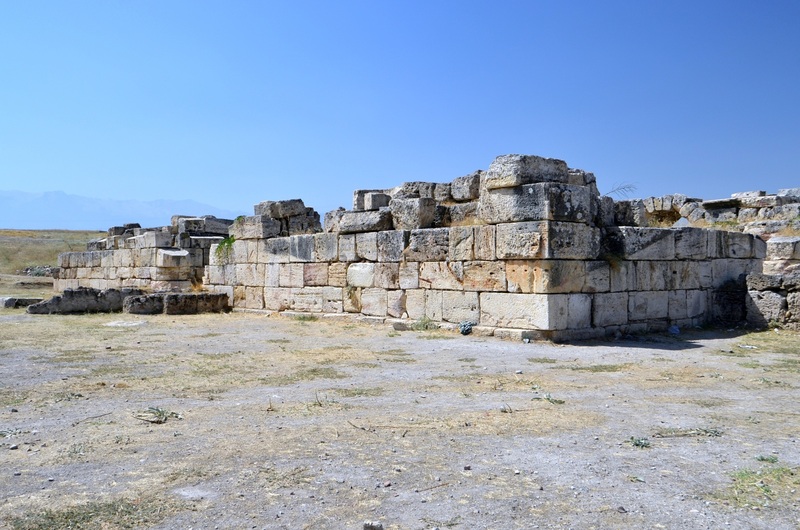 For many years, a delegation from Laodicea regularly visited the oracle of Apollo in Claros. In 25 CE, the city requested the permission for the construction of the second temple of the imperial cult in the province of Asia. 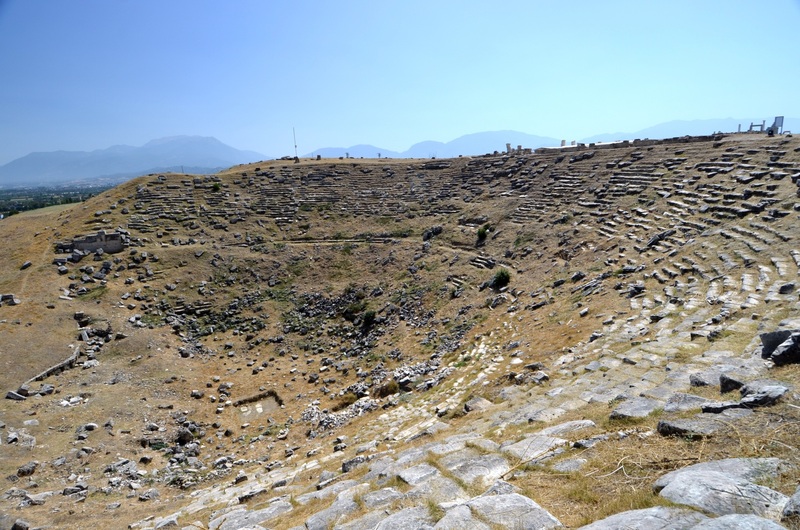 The first such temple had been erected in 29 BCE in Pergamon. Amazingly, their application was rejected because of the insufficient affluence of the city. A year later, the second temple of the imperial cult was built in Smyrna. Since the city was located in the region often suffered from earthquakes, its buildings were repeatedly destroyed and rebuilt. One of the most powerful earthquakes struck in 27 BCE, during the reign of Emperor Augustus. 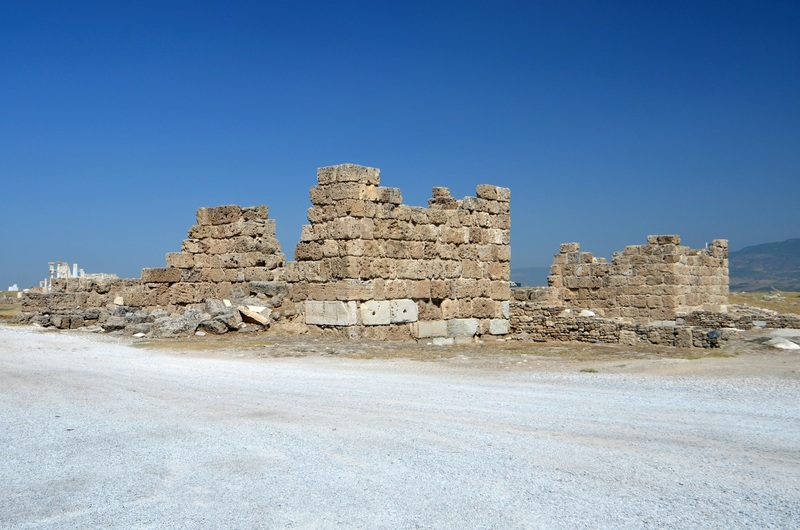 In 60 CE, another earthquake completely destroyed Laodicea. The Roman Emperor Nero offered financial assistance in the reconstruction, but the proud citizens of Laodicea rejected the offer and paid their own money for this purpose. Perhaps they were motivated by their outrage caused by the refusal of the permit to build the temple of the imperial cult. In any case, Laodicea was the only city in the province of Asia that did not welcome the emperor's financial support. The wealth of the inhabitants of Laodicea, demonstrated in this situation, was widely known in the ancient world. Laodicea minted its coins that bore the images of Zeus, Asclepius, Apollo, and later - the Roman emperors, from the 2nd century BCE. In the Roman period, the city was famous for its bankers. Even the famous Roman orator and statesman, Cicero, used their services. The wealthy Laodiceans developed a passion for Greek art and monumental buildings in Roman style. Among the most prominent residents of the city, there were philosophers representing scepticism - Antiochus and Theiodas. Another noteworthy person born in Laodicea was Polemon I, the king of Pontus, Little Armenia and the Bosphorus, whose father, Zenon, was an outstanding orator and aristocrat. 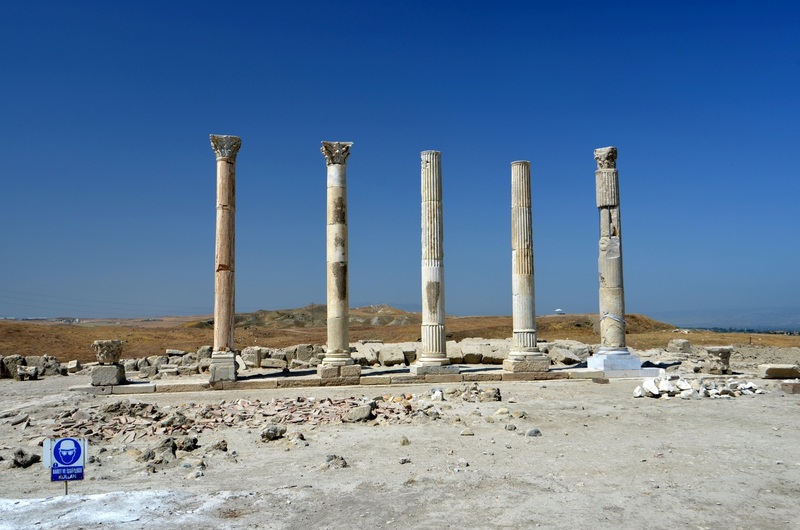 We know that Roman Emperor, Hadrian, visited Laodicea in the summer of 129 years CE. He arrived there on the way from Greece to Cappadocia, Cilicia, and Syria. 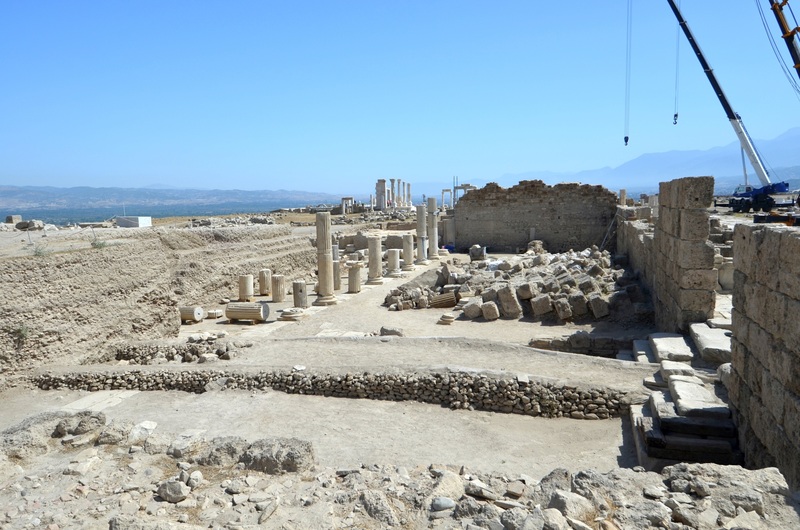 Laodicea, with its significant Jewish population that had prospered for many centuries, became a natural place for the early development of a Christian community. The name of the city appears in the New Testament for the first time in the Epistle to the Colossians, written by Saints Paul and Timothy. and for all who have not seen me face to face. Epaphras, who is one of you, a servant of Christ Jesus, greets you. so that you may stand mature and fully assured in everything that God wills. For I testify for him that he has worked hard for you and for those in Laodicea and in Hierapolis. and see that you read also the letter from Laodicea. This passage became an inspiration to write the apocryphal Epistle to the Laodiceans, allegedly addressed to the Christian community in Laodicea by St. Paul. The letter calls for joy, prayer, pristine and polite actions, and advises avoiding filthy profits. The last verse refers to the Epistle to the Colossians, returning its call as it should also be read to the Colossians, while the Laodiceans should also read the letter to the Colossians. I know your works; you are neither cold nor hot. I wish that you were either cold or hot. So, because you are lukewarm, and neither cold nor hot, I am about to spit you out of my mouth. You do not realize that you are wretched, pitiable, poor, blind, and naked. and salve to anoint your eyes so that you may see. In this regard, it is worth noting the references to the actual situation of the inhabitants of Laodicea, confirmed by the authors of antiquity. In the Revelation, there is a reference to the legendary wealth of the city and the eye ointments produced there. In addition, proud Laodiceans, boasting their famous black garments, are accused of being naked. They also receive advice to dress in white robes. It seems that the Laodicean Church was treated most harshly of all the Seven Churches of Asia, as there is not a single word of praise in the letter. Laodicea quickly gained the rank of a bishopric, but the names of its first three bishops have not been definitively confirmed. The fourth bishop of Laodicea was Sagaris, who was martyred around 166 CE. In the 363, the Council of Laodicea took place, gathering 30 bishops. The Council expressed its decrees in the form of written rules or canons. Among the sixty canons decreed, several aimed at outlawing the keeping of the Sabbath and encouraging rest on Sunday, regulating approach to heretics, Jews, and pagans, and specifying a Biblical canon. The resulting list presented the canonical books of the Bible, omitting the Book of Revelation. It is not surprising as this book described the Laodiceans bitterly as wretched, pitiable, poor, blind, and naked. The canons issued by the Council of Laodicea were later approved by the Council of Chalcedon in 451. The last bishop of Laodicea ended his mission in 1450. Since that time, Laodicea has been a titular see of the Catholic Church. However, there are no further titular bishops of Laodicea since the transfer of the last incumbent in 1968. All quotations from the Bible are from the New Revised Standard Version, published in 1989 by the Division of Christian Education of the National Council of the Churches of Christ in the USA. 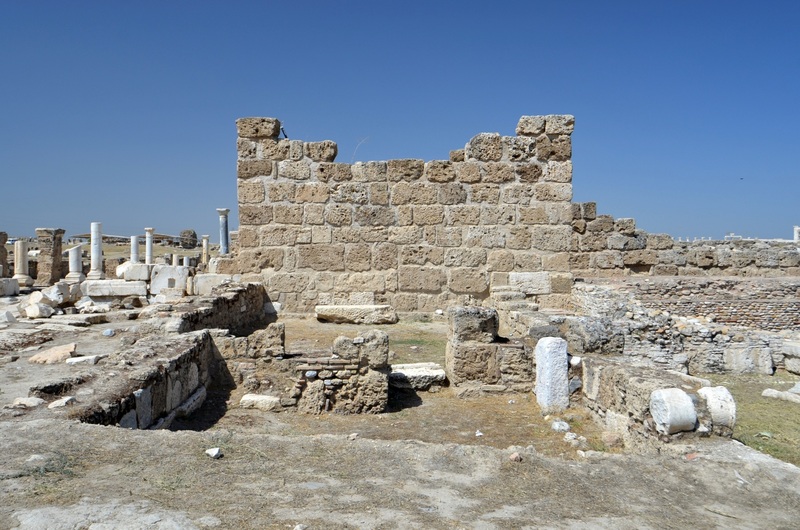 Contradictory information circulates about the history of Laodicea in the Byzantine period. 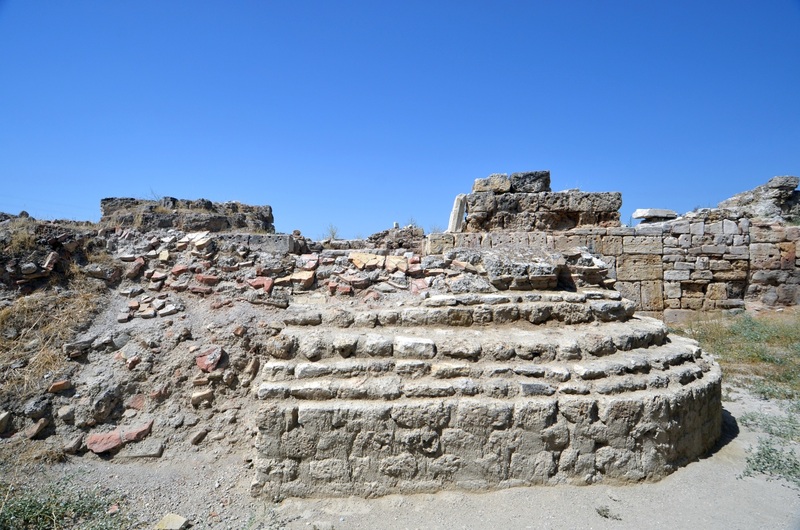 The official documents submitted in the application for the registration of Laodicea into the UNESCO World Heritage List mention that the city was abandoned after another earthquake. It was supposed to happen during the reign of Emperor Phocas i.e. in the years 602-610. This information is also repeated by Mark Wilson, in his book Biblical Turkey. 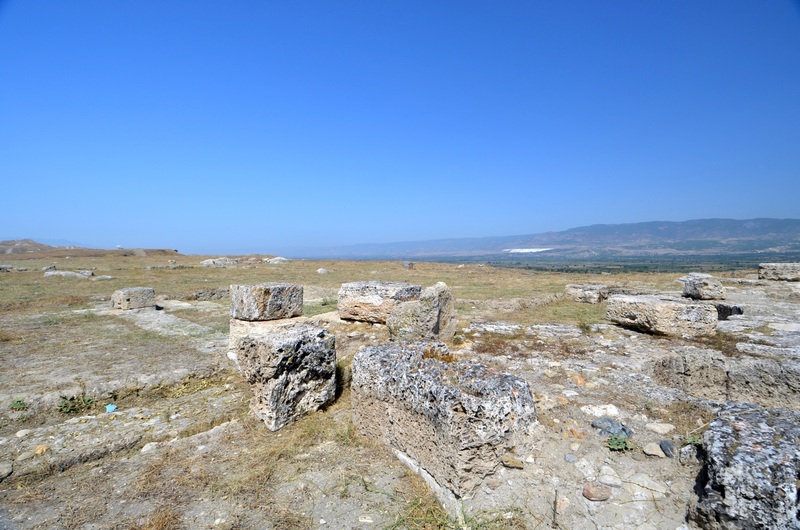 The residents Laodicea moved then to the area of the city of Denizli, where they established a settlement on the northern slopes of the mountain Salbakos, today called Babadağ. 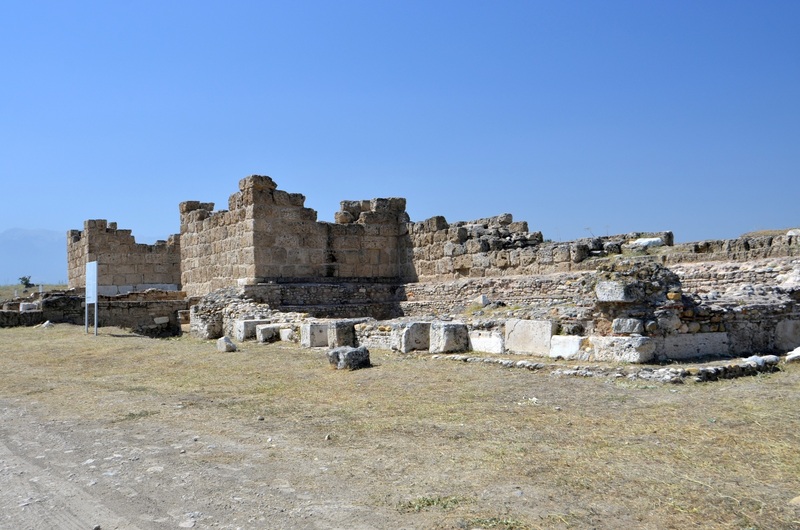 However, the information about complete abandonment Laodicea at the beginning of 7th century CE is contrary to the information provided by the Byzantine sources. Byzantine writers often mentioned Laodicea, especially during the reign of Komnenos dynasty, that is in the 11th and 12th centuries. In 1094, the city was conquered by the Seljuk army. In 1119, the Byzantine troops under the command of Emperor John II Komnenos and his military adviser, John Axouch, recaptured the city from the Turks. It was the first major military victory during the reign of this emperor. Niketas Choniates, a Byzantine historian, was the author of twenty-one books of History (Chroniké diégesis). He described the history of Byzantium from 1118 to 1206. On the pages of his work, he mentioned that Emperor Manuel I Komnenos, who reigned in the period from 1143 to 1180, fortified Laodicea. The city was repeatedly plundered during the late Byzantine Empire by the Turks and the Mongols. The last inhabitants left it in the 13th century. In modern times, the first researcher who became interested in the ruins of Laodicea was G. Weber. He carried out minor excavations there in 1833, and then in 1843. His particular interest was in the issue of water supply in Laodicea. This researcher also created the first plan of this ancient city. The first round of systematic archaeological excavations took place in 1961-1963. It was conducted by the expedition from the University of Laval, from the Canadian city of Quebec. It was headed by Professor Jean de Gagniers. The major achievement of this mission was unearthing a very impressive building of a nymphaeum, now known as Caracalla's Nymphaeum. Laodicea had to wait for the next round of systematic archaeological work until the beginning of the twenty-first century. In the meantime, in 1992, an archaeologist from the Denizli Museum, Haşim Yıldız, conducted rescue excavations in the main street of the site, know as the Syrian Street. In 1995-2002, the survey work was carried out in Laodicea by researchers from the University Ca 'Foscari in Venice. It was managed by Professor Gustavo Traversari. 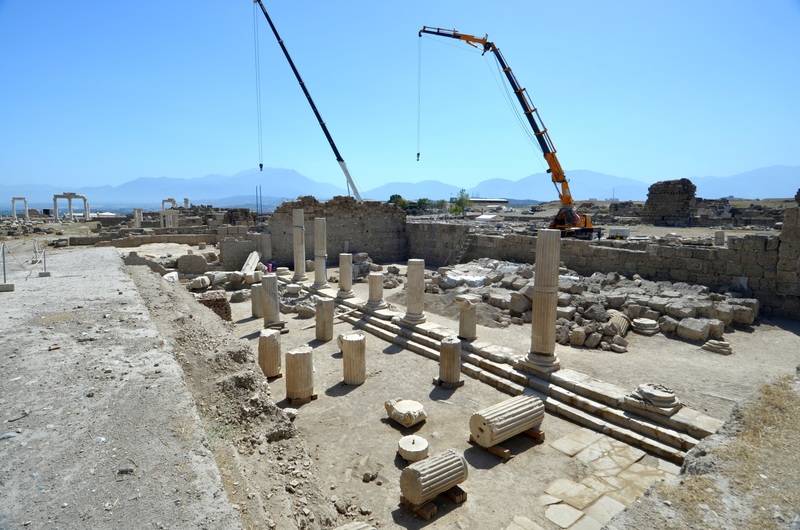 In 2002, a new round of systematic archaeological work began in Laodicea. 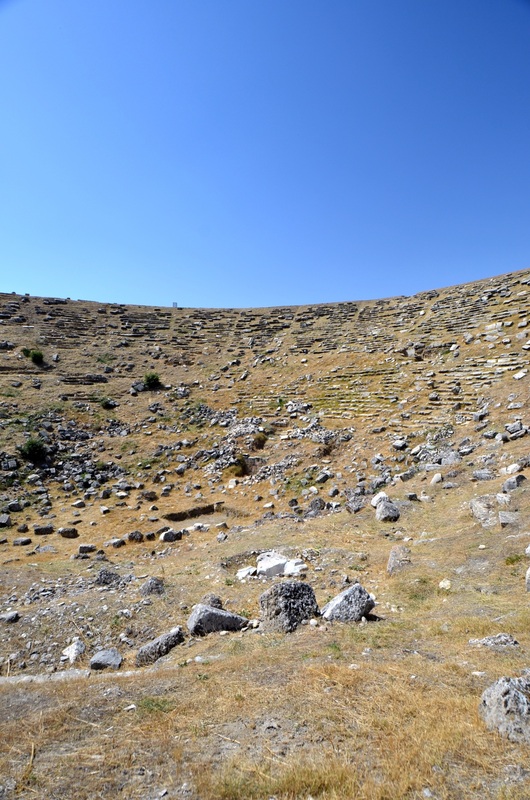 It was initiated by the Denizli Museum under the leadership of Ali Ceylan, in cooperation with the Department of Archaeology of Pamukkale University in Denizli. 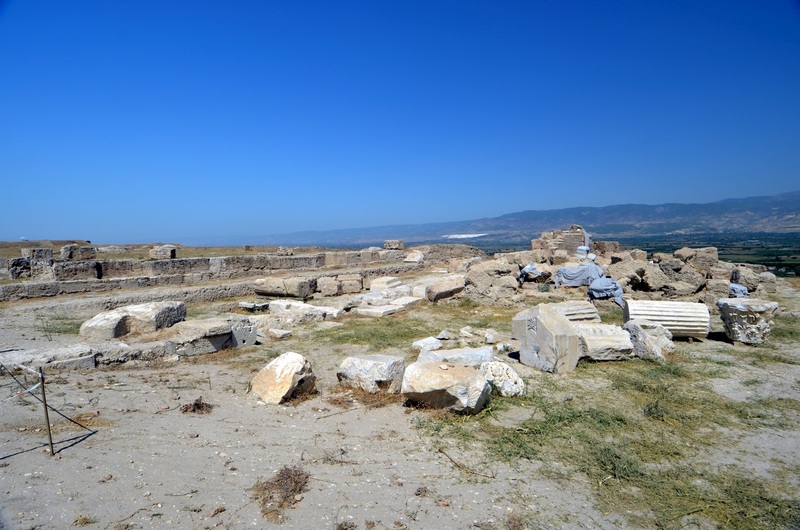 The team of Turkish archaeologists, led by Professor Celal Şimşek from Pamukkale University in Denizli has worked in Laodicea continuously since 2003. Every year, their work results in groundbreaking discoveries, throwing light on the history of the city. At the same time, intensive reconstruction work has been carried out. It is performed to restore many ancient buildings in order to make Laodicea an attractive place for tourists. In 2005, in the area of the city, a column was found, with a carved portrait of Laodice, the wife of the founder of the city, Antiochus II. Her identity was confirmed by the inscription placed on the column. In 2008, a grave of a man and woman who were buried holding each other in their arms was discovered. 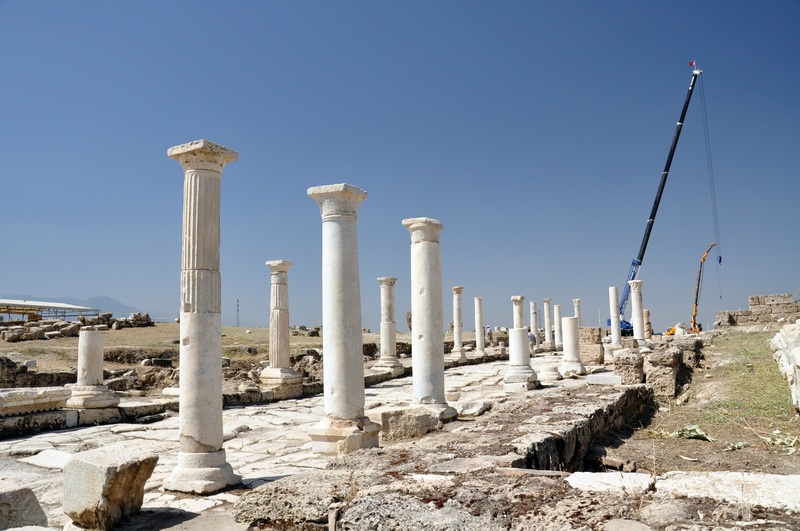 A major discovery was made in Laodicea in 2010. By using radar, the researchers were able to locate the position of the church, occupying an area of ​​2,000 square meters. Sensational headlines of Turkish newspapers triumphantly announced the "discovery of the church mentioned in the Bible." 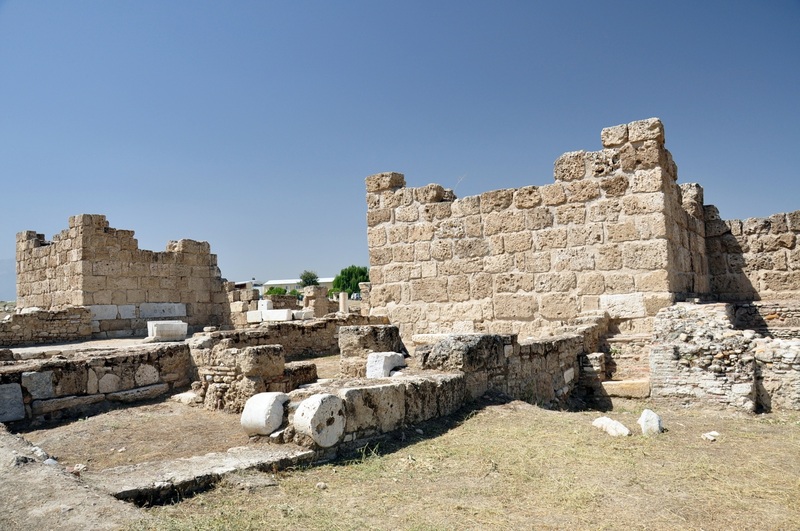 However, it must be noted that "the Church in Laodicea," mentioned in the Revelation, was not understood as a building, but as a community of the faithful. 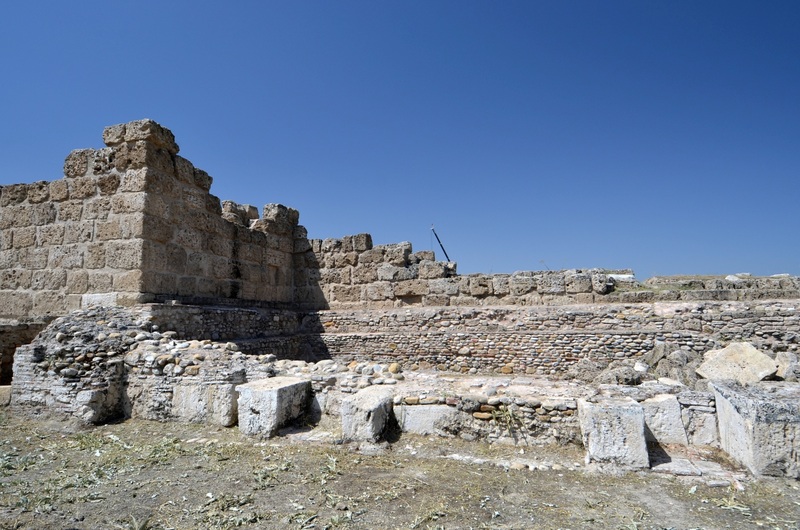 In addition, the head of excavations in Laodicea, Celal Şimşek, gave information that this building was erected in the 4th century, and thus at least 200 years after writing down the Revelation. 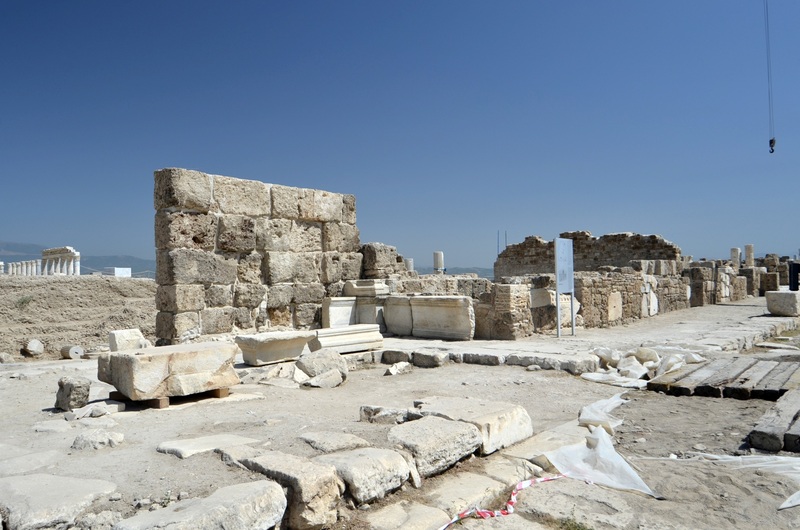 The church in Laodicea was opened to the public in 2016, after intensive excavation and restoration. It is still advertised as "one of the seven oldest churches in Anatolia," and even as "the seventh oldest church in the world." 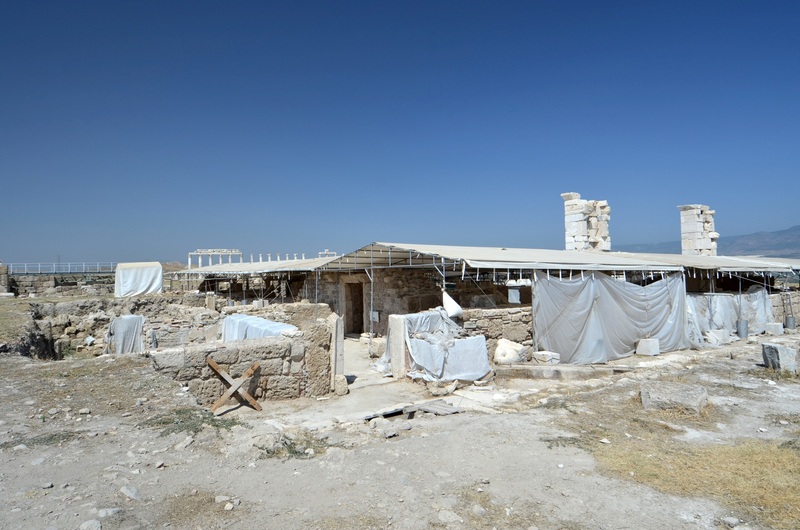 Celal Şimşek expressed the hope that as a major archaeological sensation, this building will attract to Laodicea pilgrims from around the world, as well as many of the tourists visiting the nearby Pamukkale. In 2012, the discovery of the temple of Athena was announced. This building, constructed in the 2nd century CE, is the third temple located in the holy district of the city. The other ones were dedicated to Zeus and to the deity whose identity is still the object of research. Another archaeological sensation was the discovery in 2015 of the marble block, containing the engraved inscription of the water law. The provisions of this law, issued in 114 CE, strictly regulate the use of water imported from the mountains to Laodicea. Severe financial penalties, from 5 to 12.5 thousand denarii, were imposed on people polluting water, destroying channels, or opening sealed water pipes. This law was drafted by the assembly of citizens of the city and presented for approval to the Roman governor, Aulus Vicirius Matrialis. 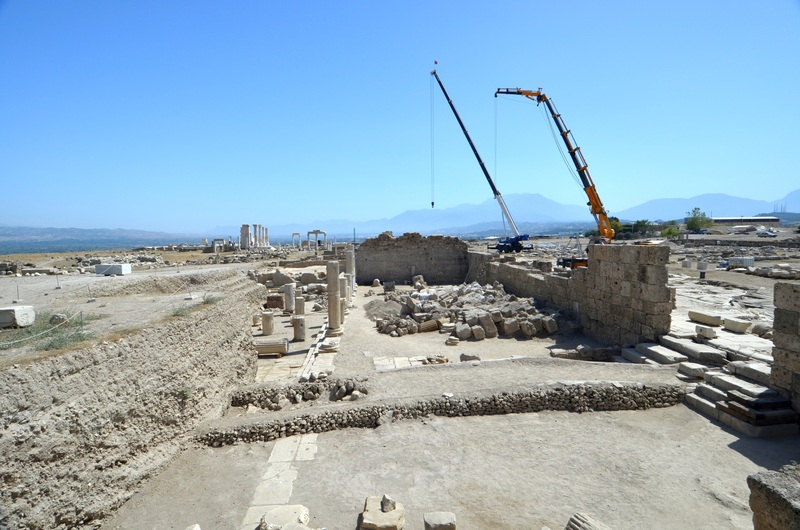 In 2017, reconstruction work is underway in the area of the Sacred Agora and the West Theater. Their aim is to turn Laodicea into "the second Ephesus" - the archaeological park that would attract millions of tourists every year. 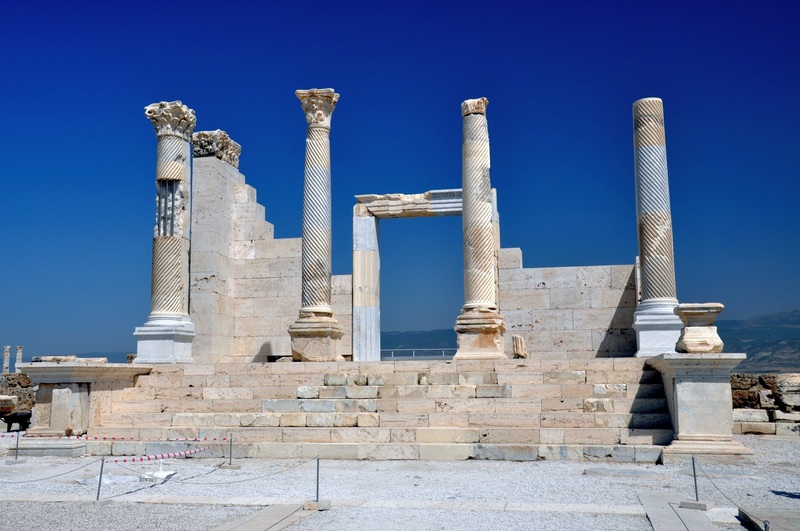 Ruins of ancient Laodicea occupy an area of ​​about 5 square kilometres. The city was built on the Hippodamian Plan, where the main avenues intersect at right angles, dividing the city into districts. 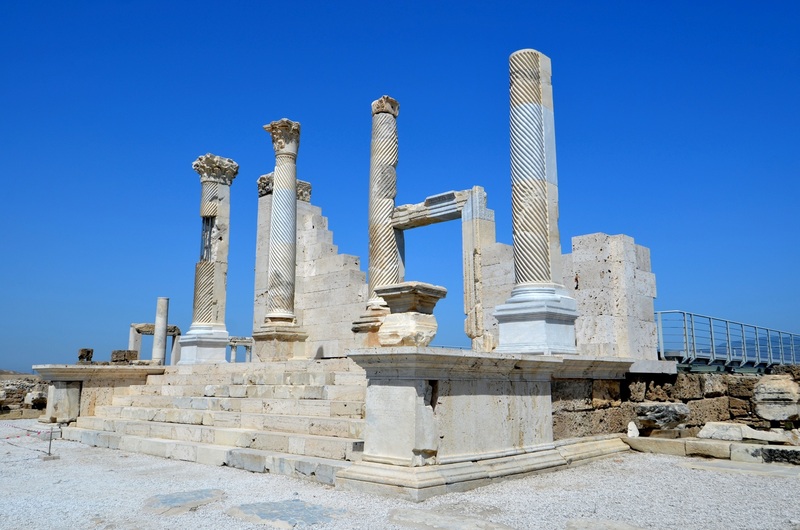 Because of the extensive archaeological and reconstruction work, Laodicea changes dramatically every year as newly discovered or rebuilt structures are open to visitors. 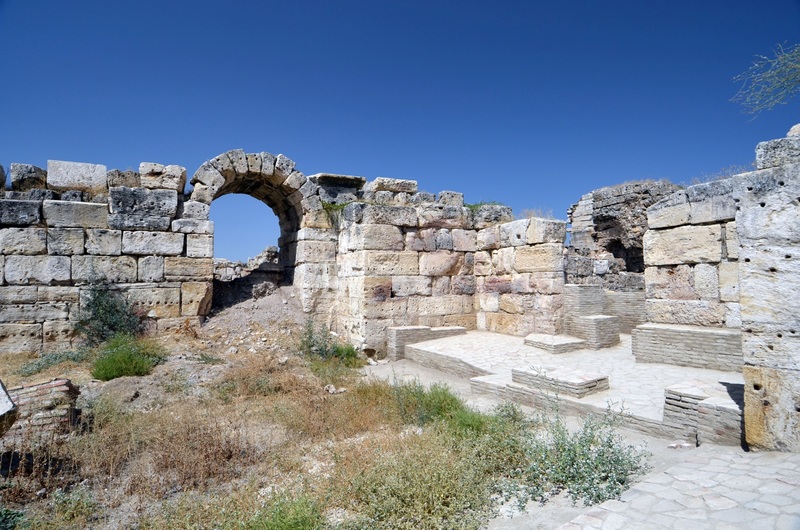 Thanks to funding provided by the Turkish Ministry of Culture and Tourism and the city of Denizli, the following ancient structures have been unearthed and restored so far: East Byzantine Gate, East Byzantine Nymphaeum, Syria Street, Temple A, Residential Complex A, Nymphaeum A (Fountain of Septimius Severus), North Theatre Street, Central Agora, Nymphaeum B, Latrines and Stadium Street. The latest addition to this set has been the Laodicean Church, discovered in 2010. In the area of ​​Laodicea visitors can see a stadium, two theaters, four complexes of Roman baths, five agoras, five monumental fountains, two monumental gates, a bouleuterion, residential houses with peristyles, four temples, six early Christian churches, public latrines, two water terminals, water distribution system, and three major avenues with colonnades. The main sightseeing route leads in a northwesterly direction along Syria Street. 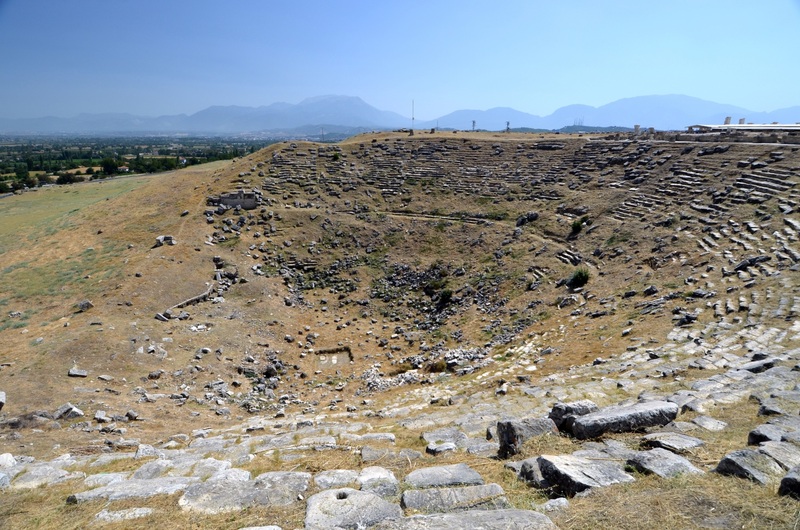 Two theatres are located on the north side of the site, and the stadium and the bouleuterion - on the southern side. The city was surrounded by defensive walls, and some parts of them are clearly visible. Outside the walls, on each side of the city, there were necropoles. 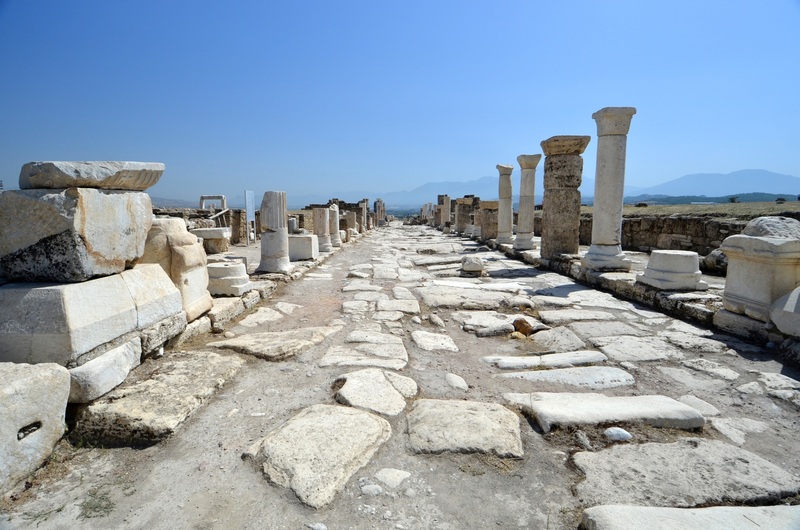 The sightseeing tour of Laodicea begins at the entrance, located on the eastern side, near the East Baths. This building stood on the north side of Syria Street. It was built in the 2nd century CE. The building has a central layout. The flat area extending to the west of the structure may have been a commercial agora. East Byzantine Gate leads the visitors to the centre of Laodicea. It was built at the end of the 4th century CE on the orders of Emperor Theodosius I the Great and his son Arcadius. It was part of the new defensive walls, which surrounded the city much reduced in size in comparison to the previous period of prosperity. Just outside the gate, on the north side of the road, researchers have discovered so-called Room with Pithos. It was probably the centre of wine production. On the north side of the gate, there are the remains of the East Byzantine Nymphaeum. This impressive fountain was erected on a rectangular plan with dimensions of 21.5 to 10 meters. Its construction dates back to the 5th century CE, and bricks and stones obtained from the riverbed were used as the building materials. The main water tank, sealed with mortar, had a depth of 2.2 meters. This fountain supplied drinking water to people living outside the city walls and to the travellers arriving at Laodicea from the east. 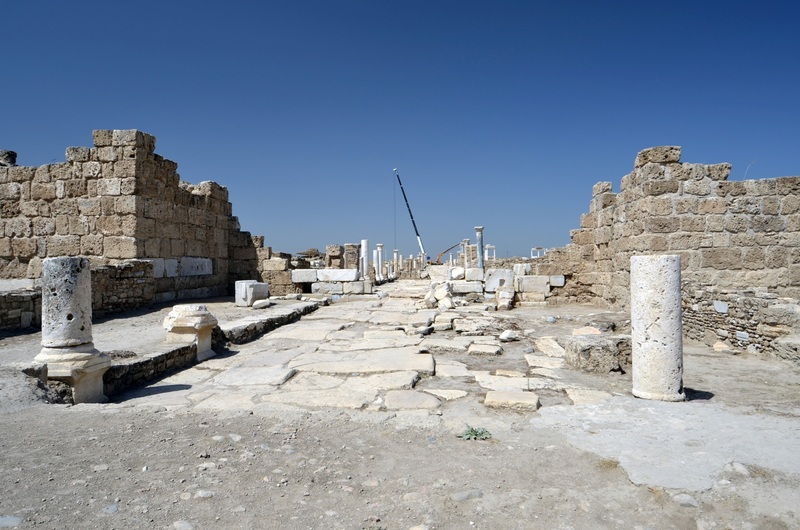 Syria Street, lined with marble slabs, next leads visitors to Temple A, built in the 2nd century CE. This temple underwent renovation during the reign of Emperor Diocletian at the end of the 3rd or the beginning of the 4th century. In the 4th century, this building served as an archive. It was destroyed by an earthquake in 494. Currently, it has now been partially restored, and the glass floor allows looking more closely at beautifully carved columns and the foundations that support the temple. 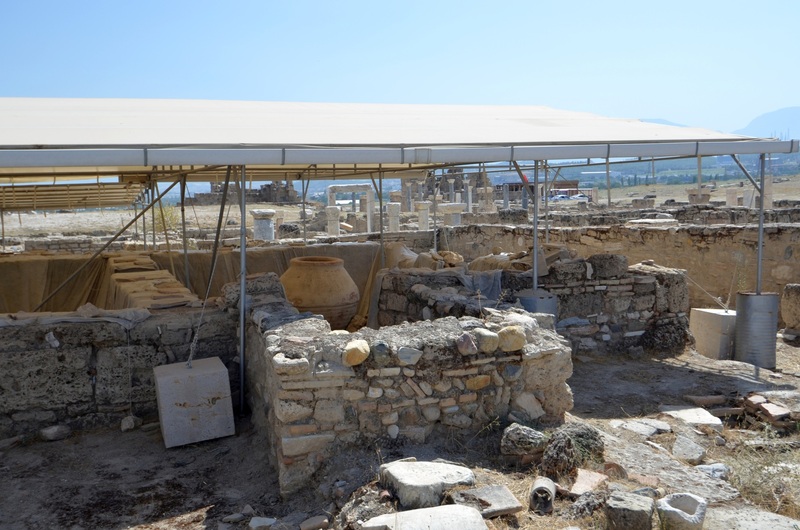 On the northern side of the temple, there is a newly restored church, called the Laodicean Church. 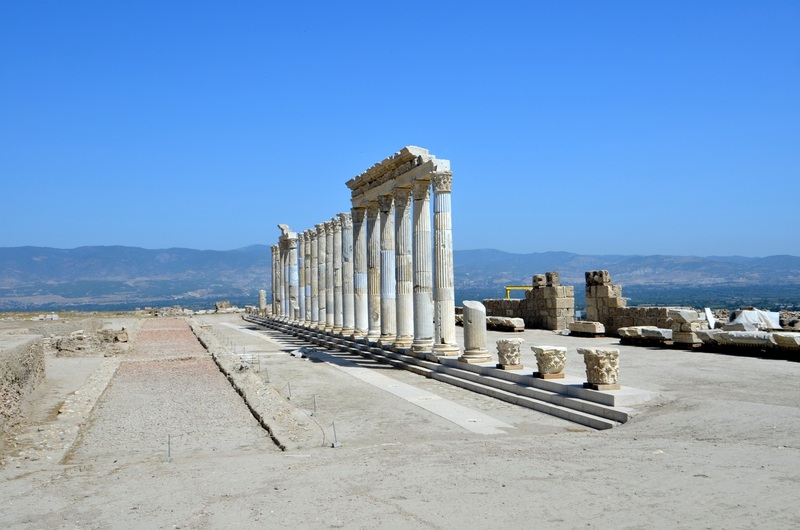 It is now the main tourist attraction of Laodicea. The building was discovered and completely unearthed in 2010. This is one of the oldest Christian churches in the world. Its construction dates back to the reign of Constantine the Great, that is, to the first half of the 4th century CE. The building was severely damaged by an earthquake in 494 but was later rebuilt. It was finally destroyed by the earthquake that struck Laodicea during the reign of Emperor Phocas that is in the years 602-610. Today, the building has been covered with a protective roof, and a partly transparent platform has been prepared for the visitors. The building has an innovative plan because it has eleven semicircular apses and two entrances. The interior is a three-aisled basilica, where the floor is decorated with numerous mosaics. They provide information about the names of two deacons - Polycarp and Alexander. The church walls were decorated with frescoes and marble slabs. On the western side of, Temple A stands a monumental Fountain A, also known as Fountain of Septimius Severus. This building was erected from the blocks of travertine during the reign of Emperor Septimius Severus. According to its inscription, the fountain was dedicated to this emperor. 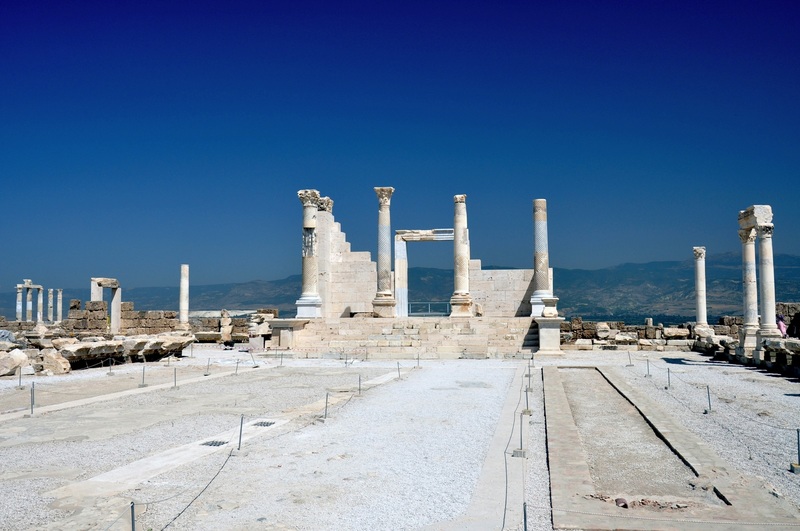 It was destroyed, like many other buildings in Laodicea, during the earthquake in 494. In the Byzantine period, two small rectangular pools were built in front of its parapet. Originally, this building consisted of a rectangular pool, surrounded on three sides by two-storey façades. Their lower level was adorned with the columns of composite order, combining the elements of Ionic and Corinthian orders. The higher level was decorated with columns in the Corinthian order. The pool was filled with water flowing from five taps. When the pool threatened to overflow, excess water was discharged into the sewer pipes. On the east and west side of the building, facing Syria Street, there were statues of lions, and the spaces between the columns were decorated with statues of the deities of the Greek pantheon, including goddesses Athena and Tyche. Propylon I is a monumental gate, standing at Syria Street, opposite the western corner of the Central Agora. It was built at the end of the reign of Emperor Septimius Severus. The building was destroyed by an earthquake at the end of the 3rd or the beginning of the 4th century and then rebuilt. It collapsed completely during the earthquake in 494. Propylon I led into the North Agora, also called Sacred Agora. In the area of ​​this huge square, the archaeologists managed to discover the three temples, dedicated to Athena, Zeus, and an unidentified deity. Sacred Agora occupies an area of ​​35,000 square meters. The renovation work in the agora included the re-erection and reconstruction of the colonnades that once surrounded the square. The back of the agora was delimited with a wall, 100 meters long and 11 meters high, covered with paintings. Opposite the nymphaeum and the propylon, on the south side of Syria Street, there was the Central Agora of the city. This square has a shape of a rectangle, with sides 112 and 60 meters long. On three sides, it was surrounded by porticos, placed on a two-stage platform. The south portico bordered Central Baths, while the east and west porticos led to the shops. During the Roman period, this agora was lined with marble slabs. Central Baths, located on the south side of Central Agora, occupy an area measuring 89 to 58 meters, i.e. four blocks in the Hippodamic system. This building was constructed in the 2nd century CE. It was damaged by the earthquake in 494. Later it was used for other purposes until the early 7th century. The bath complex, designed with the cascaded layout, comprised caldarium - a hot hall, tepidarium - a lukewarm hall, two frigidaria - with cold water, and two apodyteria - changing rooms. On the western side, there was palaestra - an exercise area. On the west, there is the triple arched entranceway. 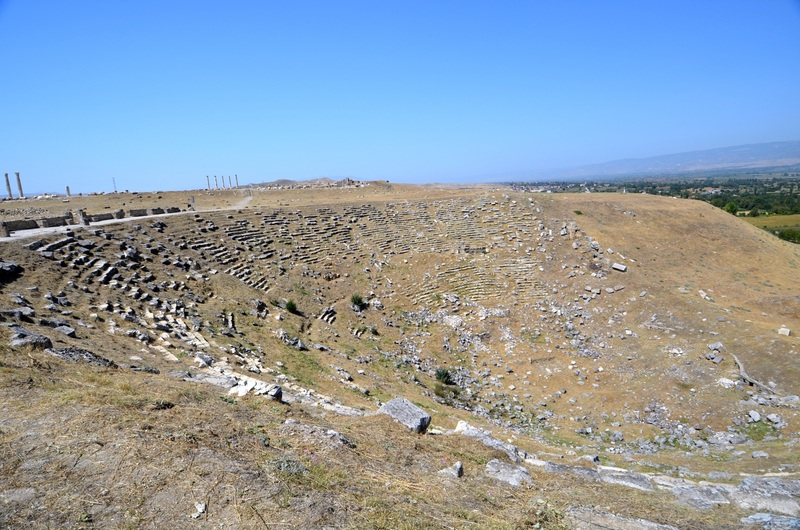 There are two ancient theatres on the north side of Laodicea. 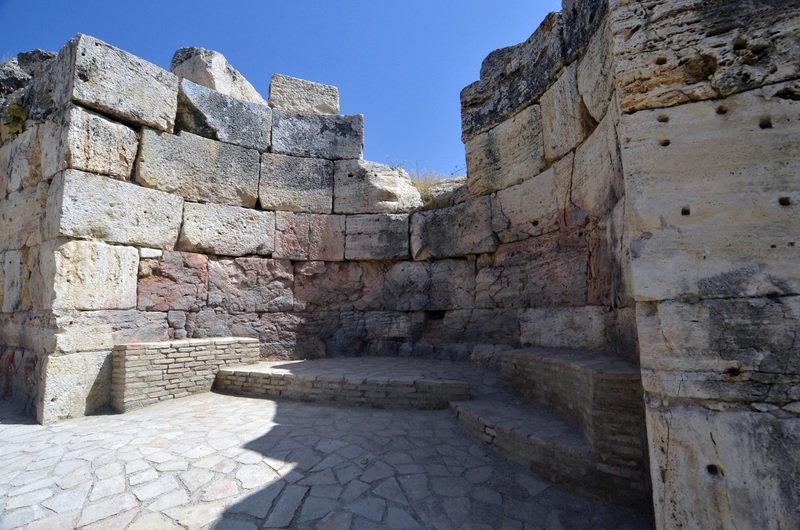 The older and smaller of them is the West Theatre, built in the Hellenistic period. It is oriented to the north-west, and from the upper rows, one can see the white terraces of Pamukkale. Spectators were protected from the sun by an awning, mounted on wooden poles. There are visible holes where these poles were attached. The North Theatre was constructed when the West Theater became too small for the needs of the growing city. The new theatre was erected of marble. The theatre was built into the hillside in the Greek manner. It faces north-easterly direction, towards the valley of the Lycus River. Currently, 19 rows of seats in the lower section and 27 rows in the upper section are visible. It is not known how many rows the building had originally because some of them collapsed, and some have been dismantled for the construction purposes. It is estimated that the North Theatre could sit around 12,000 people. The names of civic associations and leading families of Laodicea were engraved on the seats, marking the places reserved for them. 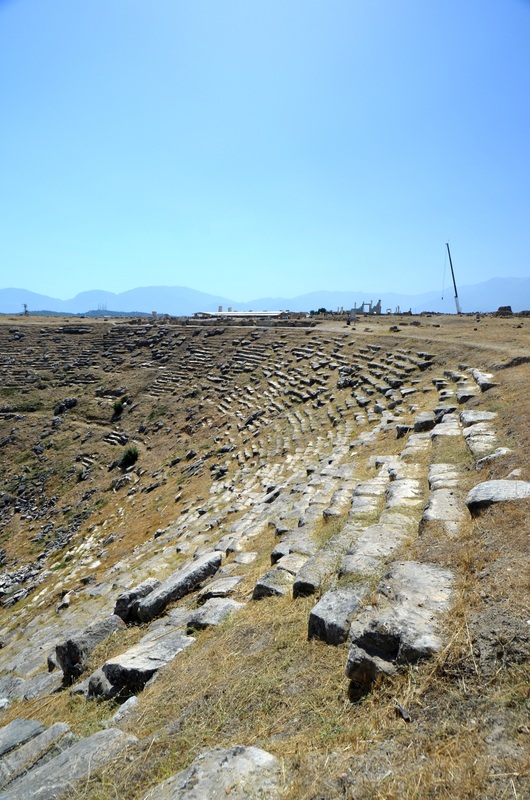 The theatre was used for the organisation of various shows, possibly even water games, up to the 7th century. In the later period, it became a convenient source of building materials. Between the two theatres, on flat ground, there are the ruins of the North Basilica, built in the 5th century CE, and an earlier Corinthian Temple. Both buildings have been severely damaged by agricultural activities. 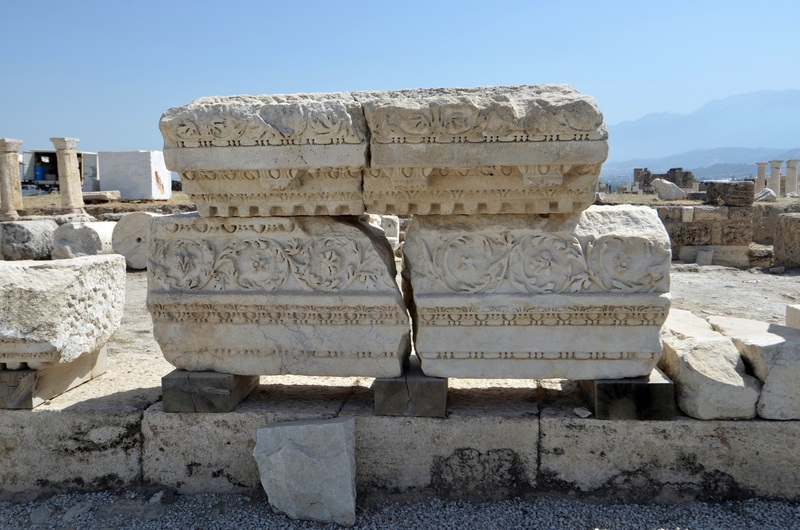 In the area, there are numerous scattered fragments of the marble blocks. Some of the columns have inscriptions of the Roman period, from the 1st and the 2nd centuries CE. According to these incomplete records, the construction of the temple was financed by a leading family of Laodicea, probably in honour of an emperor. The church was built from blocks of travertine, on the plan of a three-aisled basilica. Researchers date back its construction to the end of the 5th century, after the earthquake of 494. The basilica served the residents of the city to the 7th century. 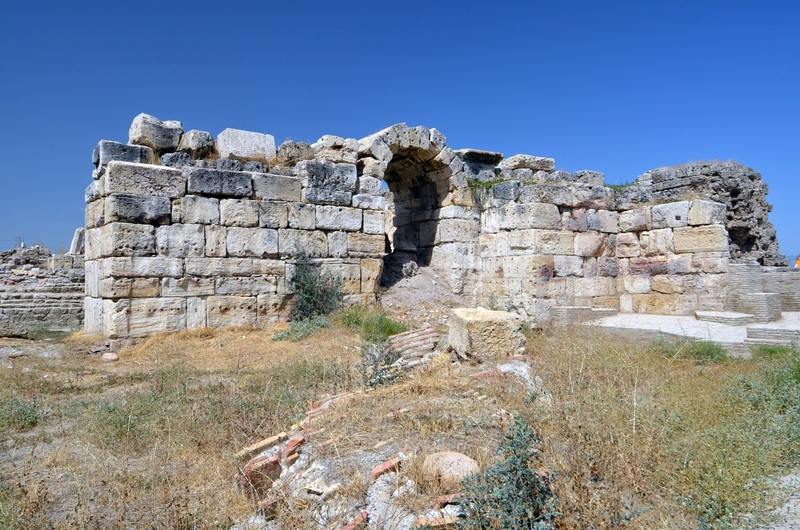 On the western side of the city, there is a ruined gate, know as Ephesian Gate. It was built at the end of the 1st century CE and dedicated to Emperor Domitian. It had the form of a triple arch, with watchtowers on both sides. Ephesian Street led through the gate westward along the Meander River valley, to Ephesus. Near the Ephesian Gate, this road crossed the Asopus River, on a partially preserved bridge, known as Roman Bridge on Asopus. In the western part of Laodicea, the are the impressive remains of an ancient Stadium. 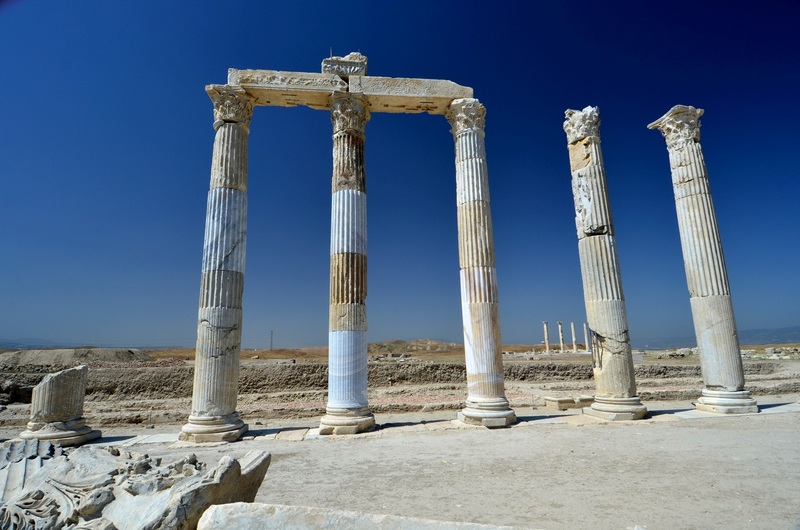 According to information on Laodicea provided by UNESCO World Heritage List, it is the largest stadium in ancient Anatolia, although other sources are carefully writing about it as "one of the greatest". Oriented along an east-west axis, the stadium was built into the slope of a hill. This structure had the length of 285 meters, the width of 70 meters, and could accommodate up to 25,000 spectators. The stadium was built in 79 CE and was dedicated to Emperor Vespasian and proconsul Marcus Ulpius Traianus, the father of the future Emperor Trajan. The funds for the construction came from the pocket of a Laodicean citizen named Nikostrate. On the northern side of the stadium, stands the complex of South Baths. This building has impressive dimensions of 133 to 75 meters. 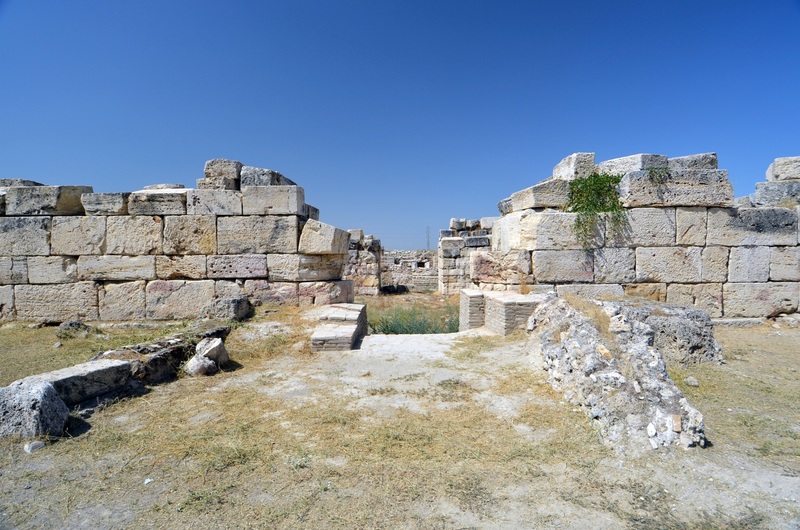 The complex, combining the role of baths and a gymnasium, was dedicated to Emperor Hadrian and his wife Sabina, on the occasion of their visit to Laodicea in 135 CE. The building served competitors practising in the adjoining stadium. On the eastern side of the baths, there is South Water Distribution Terminal Water, in Latin referred to as castellum aquae, i.e. a water castle. It supplied water to the nearby baths, and to the Central Water Distribution Terminal, located in the central part of Laodicea. 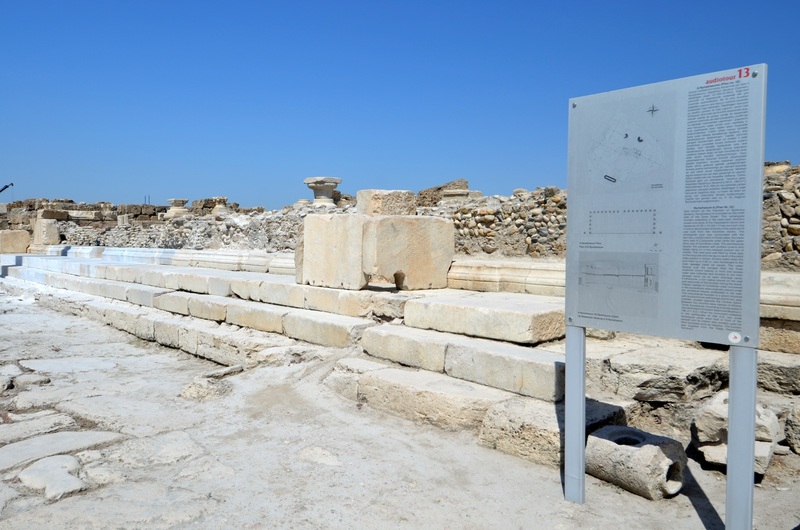 On the north side of the South Baths, there was the state agora, now called the South Agora. It had dimensions of 135 to 90 meters. Its official function is testified by the presence of Bouleuterion, the place of meetings of the town council, standing at its north side. It could accommodate 500-600 people. This building, dating from the reign of Emperor Hadrian, probably also served as a small theatre i.e. an Odeon for musical performances. The water was imported to Laodicea via the system of aqueducts, pipes, and syphons, from a spring known today as Başpınar (i.e. the Main Spring). 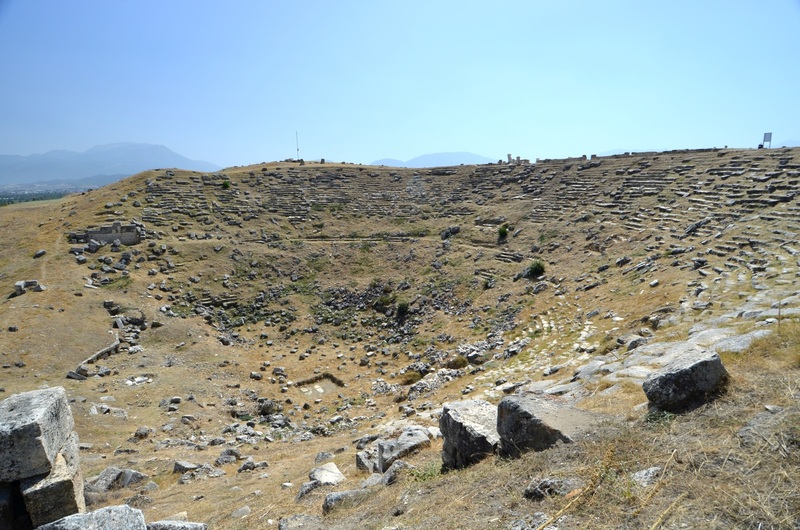 It is located about 8 kilometres south of Laodicea and continues to serve the residents of nearby Denizli as a source of drinking water. Water from this source has high mineral content. Their deposits are visible in the water distribution terminals in Laodicea. 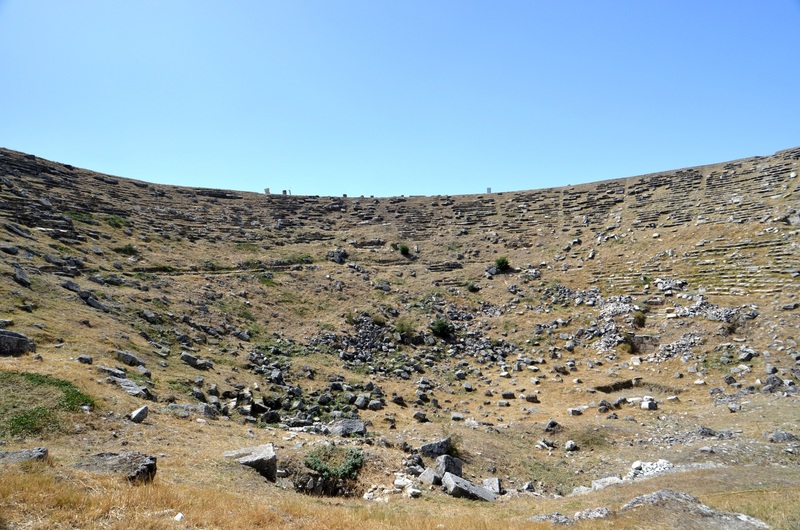 Fragments of ancient pipes and an aqueduct, destroyed by an earthquake, can be found on the route between the Başpınar spring and Laodicea, in the village of Eskihisar. 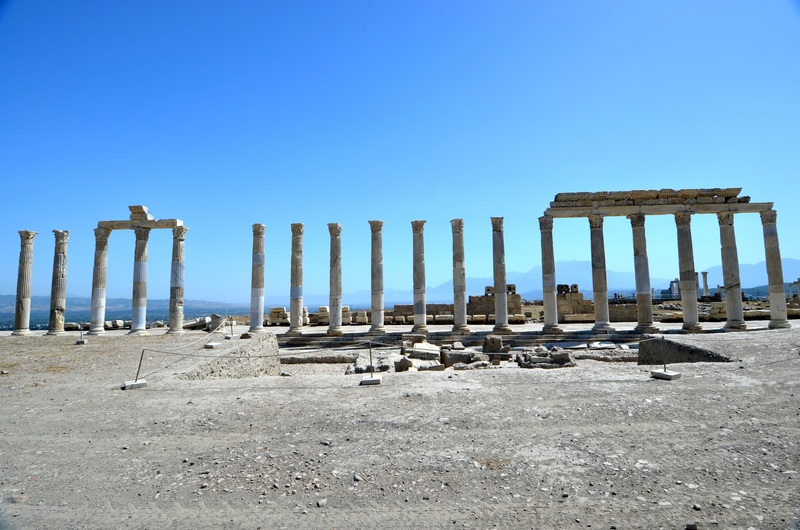 The ruins of Laodicea are open to visitors daily from 9:00 am to 6:00 pm. In 2017, the price of a ticket has been 10 TL. There are many information boards in Turkish and English near the most prominent monuments. The area of the ancient city is very vast and almost entirely unprotected from the sun. On sunny days, remember about sun protection and stock up on drinking water supply before starting the exploration. There is a small café at the entrance to Laodicea. 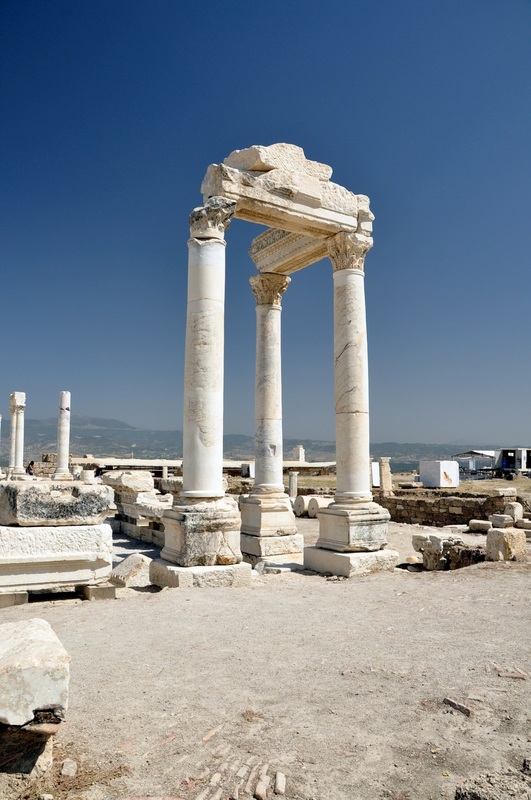 With public transport: the coach from Denizli to Pamukkale stops in Korucuk village, situated just 1 km from Laodicea ruins. 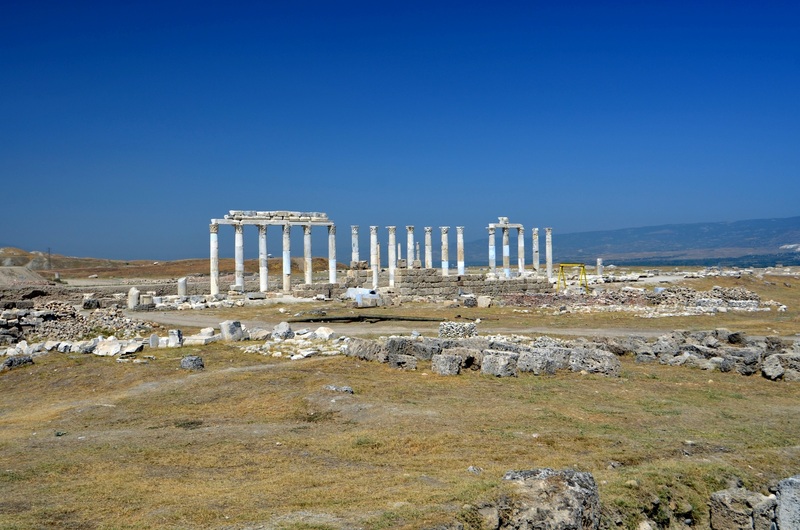 With a travel agency: there are travel agencies in Pamukkale that organise sightseeing tours of Laodicea and other nearby ancient sites. 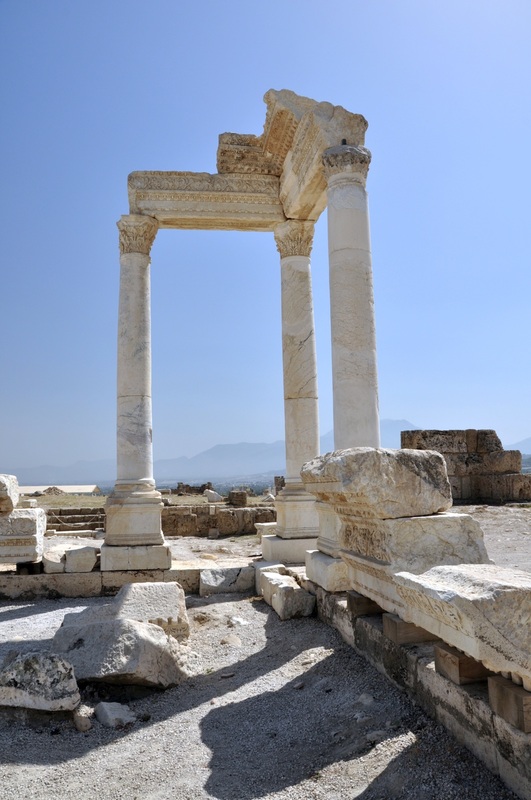 By car: Laodicea is situated next to the D320 route that connects Aydın (126 km to the west) with Dinar (110 km to the east). 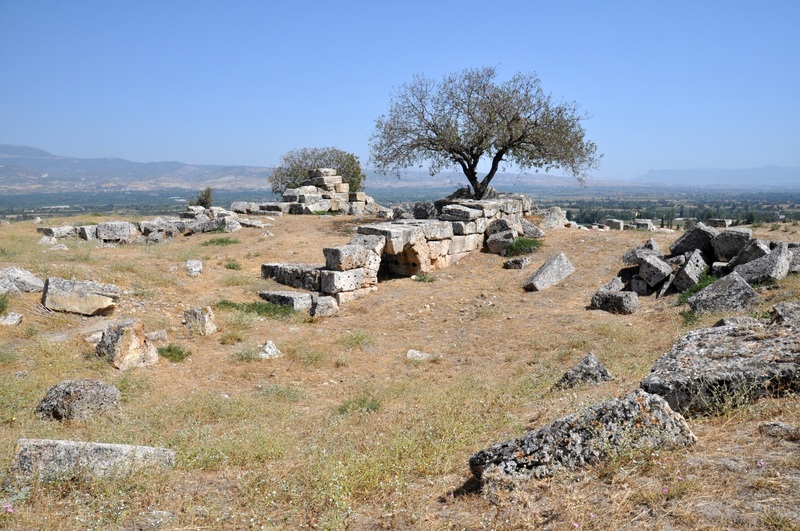 The closest city is Denizli, as its centre is located just 7 km from this site. The nearest accommodation options are available in Denizli.